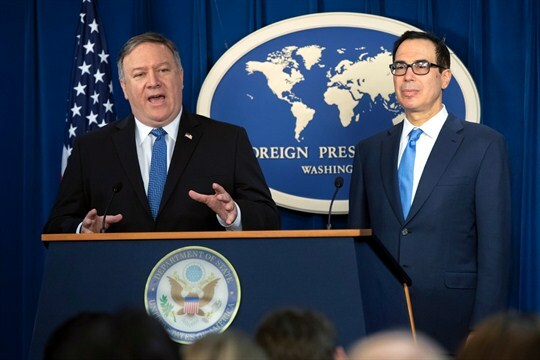 Secretary of State Mike Pompeo, left, and Treasury Secretary Steven Mnuchin, present details of the new sanctions on Iran, at the Foreign Press Center in Washington, Nov. 5, 2018 (AP photo by J. Scott Applewhite). President Donald Trump is again sending mixed signals on an important policy. Earlier this month, his administration followed through on reimposing oil sanctions against Iran, though the immediate effect is on third parties doing business with Tehran. He then immediately waived the sanctions for six months for eight countries that are Iran’s major oil and gas customers, explaining the waivers by saying he did not want to roil oil markets.